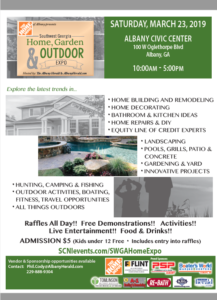 Join us for the 2019 Southwest Georgia Home, Garden & Outdoor Expo presented by Home Depot and hosted by the Albany Herald Saturday, March 23 at the Albany Civic Center from 10am-5pm. Explore new trends in home, garden and outdoor fun with professionals standing by to help you with home repair, remodeling, & building, DIY, landscaping & gardening, hunting, fishing, camping, boating and much more! This entry was posted in Member Announcements on February 12, 2019 by Mary Bickerstaff.